What you should know about choosing the right Prescription Drug Plan for you. Medicare Part D Plans are also called Prescription Drug Plans, and they cover your prescription drug costs. These plans are offered by private insurance companies. Add a Medicare Part D plan to your Original Medicare Plan. Original Medicare is offered by the federal government and consists of Medicare Part A (hospitalization) and Medicare Part B (medical services including doctor visits). When you get Original Medicare, you must also sign up for a Prescription Drug Plan. Choose a Part C Medicare Advantage Plan that includes prescription drug coverage instead of getting Original Medicare. If your Medicare Advantage Plan does not include a Prescription Drug Plan, you will have to buy Part D separately. Each Medicare Prescription Drug Plan covers different drugs and displays them on its list, which is also called a “formulary.” Many Medicare formularies classify drugs by tiers, and each tier has a different cost associated with it. That means one drug you take could be tier 1, while another could be tier 3. Before you choose a Prescription Drug Plan, make sure you look at the plan’s formulary to see if your medications are covered and how much they will cost. You’ll also want to make sure that the plan you’re interested in covers your local pharmacy. Most people are eligible to sign up for a Prescription Drug Plan during a seven-month window surrounding your 65th birthday—the three months before you turn 65, the month you turn 65, and the three months after your 65th birthday. After that, if you want to change plans in any way, you need to wait until the Medicare Open Enrollment period, which is from October 15 to December 7 each year. Important note: If you don’t sign up for a Prescription Drug Plan when you sign up to get Medicare, you could pay a penalty; those who go more than 63 days without a Prescription Drug Plan are charged a late enrollment fee, which goes up for every month you are uninsured. The cost for Medicare Prescription Drug Plans varies depending on the insurance company. In 2018, monthly premiums could be as low as $13 or upwards of $88. Your annual deductible with any plan cannot be more than $405. If you are opting for Original Medicare, the best thing to do is shop private insurance companies and compare benefits and prices of Prescription Drug Plans. One great place to start is the plan finder offered by Medicare.gov, the federal government’s website. With the plan finder, you can enter your zip code and the name of the medications you take, and compare plan costs that cover your medications. The Donut Hole: What is it? 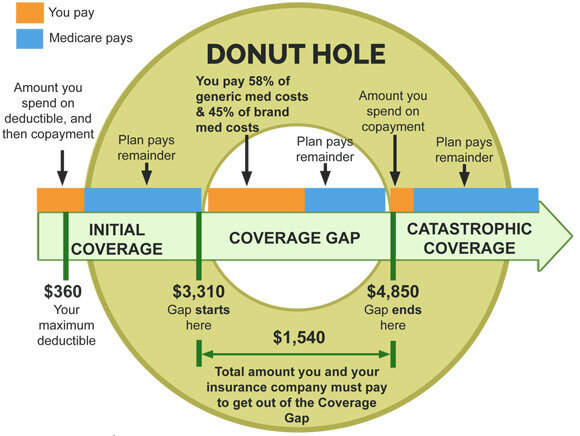 If you regularly take prescription medication, you’ve likely heard of the “donut hole,” a gap in prescription drug coverage under Medicare Part D.
In 2018, after you pay your $405 deductible and your plan pays $3,345 for covered medications (a total of $3,750), you enter the donut hole. When you reach the donut hole, your normal coverage ends and a new rule applies: You pay a certain amount for your medications (44% for generic and 35% for brand-name) until you and your Part D plan spend a combined total of $1,250. Once prescription drug costs paid by you and your Part D Plan exceed $1,250, you leave the donut hole, and you are responsible for co-payments only—your Part D plan pays the rest of the drug costs.